Around twice or three times in a year I would develop recipes for this silly little blog, Pepper.ph. With my ingredients and dishes in tow, I would head to their cool studio and feed the team (after taking awesome photos of the food, of course!). They are the nicest people, not to mention über talented! A few months ago, the recipes I developed for them were mostly make-your-own dishes. One of which was a make-your-own Ricotta Gnocchi with Spicy Marinara Sauce. Soft, cheesy and crunchy (if toasted!) bites await you in this dish! For this variation, I made a ratatouille sauce. My attempt to make it healthy is feeble (because of all the cheese!) but at least I can say that I TRIED! In a large mixing bowl, mix the ricotta, egg, cheese, and ¾ cup of the flour until all ingredients are incorporated. Cover and refrigerate for 15 minutes. In a medium saucepan on medium-high heat, sauté onions for 2 minutes and add garlic, salt and pepper. Sauté for another minute. Pour all the contents of the canned whole tomatoes in the sauce pan. Bring to a boil, lower heat and simmer for 20 minutes. Add basil leaves whole to flavor the sauce and fish out after 10 minutes. In a separate pan over medium-heat, fry eggplant and zucchini cubes, about 2 minutes until slightly brown. Drain cooked veggies and mix together with marinara sauce and add the roasted bell peppers. Simmer ratatouille sauce for another 10 minutes to let the flavors marry. Sauce should thicken a bit. Put a large pot of water on the stove and bring to a boil. Season water with salt once it begins to boil. Check the dough, if it is too sticky sprinkle a bit more flour and slightly knead. Sprinkle your hands and your table top with some flour and break off golf-ball sized pieces of dough and roll until it is about ¾in thick logs. Cut with a knife ¾ inch pieces, it should look like mini pillows. This point, you can shape using the back of a fork or you can leave it looking rustic. Place ricotta gnocchi pieces on a floured baking sheet. Drop the gnocchis onto the pot of boiling water, you will know when done when it floats onto the surface. Top or mix with ratatouille sauce, parmesan cheese and fresh parsley. 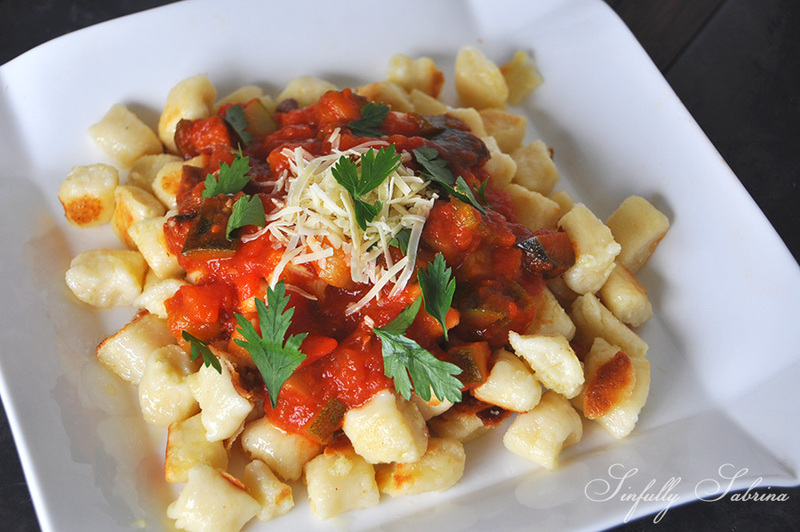 I toasted the gnocchi in this photo in a shallow pan with a little bit of olive oil. It adds another depth of flavor and an element of crunch.